Regal Sunburst, a gold foil and letterpress wedding invitation from our new collection Dependable Weddings, has an interesting set of design inspirations. Originally, we designed it for a client whose wedding inspiration was Willy Wonka and the Chocolate Factory (the 1971 film starring Gene Wilder). This design inspiration was a bit of a secret – the bride didn’t want the theme to be overt or even identifiable, but she did want to incorporate the rich color palette and dark exuberance of Willy Wonka. Whenever you’re working with Wonka, gold foil must be involved in the invitation, of course. Even if you don’t include a literal Golden Ticket, you can’t omit gold altogether. Plum references Wonka’s coat, and is the natural choice for a background color. The sunburst pattern tips its hat to the rich, op-art patterns of the Wonkaverse, in particular the iconic tunnel scene. But not so terrifying, of course! After all, a wedding is a joyous occasion! 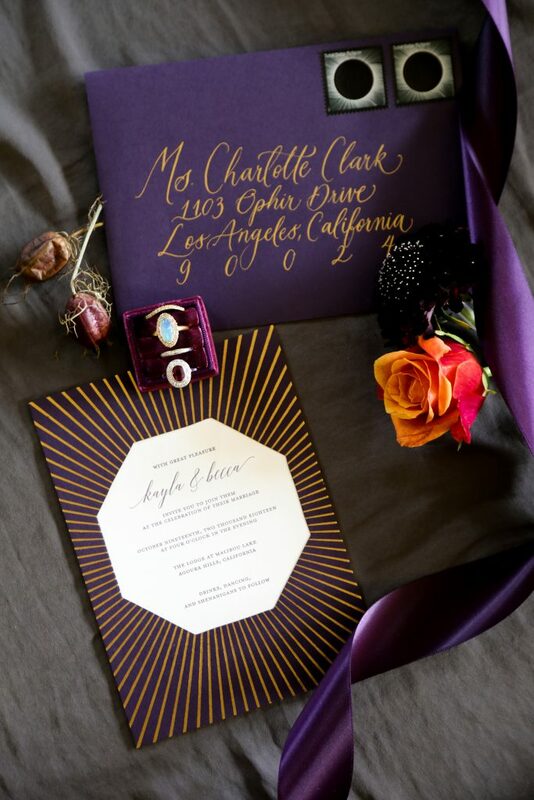 Plum is also the color of royalty, hence the name “Regal Sunburst.” Especially when paired with gold foil, deep purple lends a feeling of true luxury to the invitation. Originally, the die-cut window in the invitation was oval shaped. 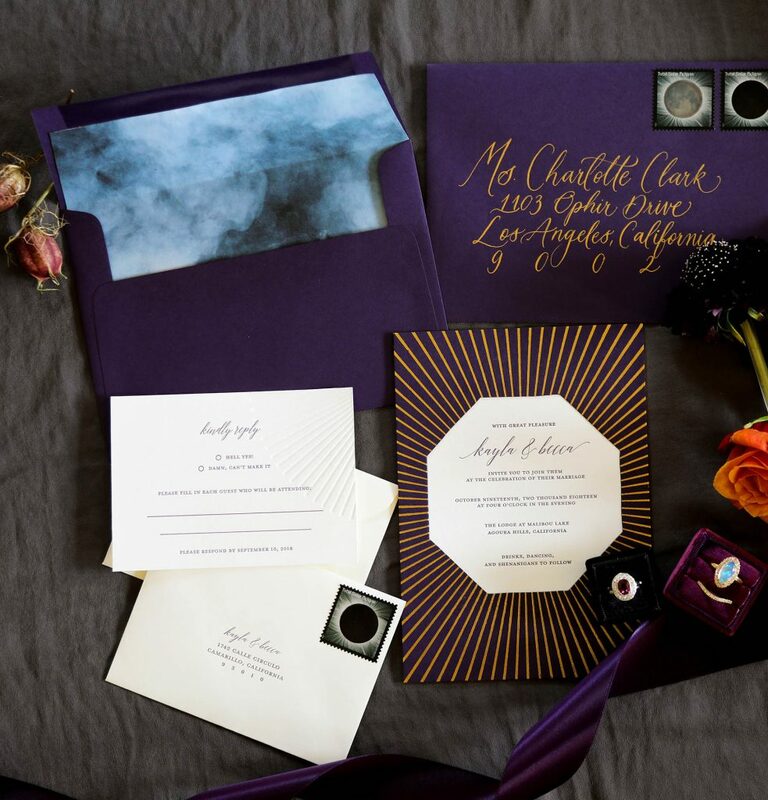 However, almost a year after the design was originally developed, Trista Maja Photography and LB Events were organizing a dark, moody wedding inspiration photoshoot, and needed an invitation suite to go with it. The color palette was exactly right. It coordinated well with the sumptuous decor and overall mood. However, they asked if the oval could be changed to an octagon, to match the octagon-shaped chuppah. So we traded an octagon window for the oval. We were so happy with the way it turned out that we made it a permanent part of the design! The addition of the smoky envelope liner was also done for this styled shoot. Your invitation is your guests’ first taste of your wedding, so it must convey the right mood. For luxurious, offbeat or bohemian weddings, Regal Sunburst makes a serious statement. It’s probably not right for a delicate, feminine affair. Nor would it suit an afternoon garden party. But if your wedding is the kind of party planned around the phases of the moon, this might be the invitation for you. If the bride plans to wear a crown adorned with amythest crystals, or if the groomsmen sport purple silk pocket squares, this invitation is for you. The styled shoot including Regal Sunburst was featured in Offbeat Bride. For more details, and to shop this design as well as our other letterpress wedding invitations, click here. We provide transparent pricing for all of our suites, but if you are interested in further customization don’t hesitate to get in touch. Contact us to inquire about any pieces or add-ons not already on offer, we are happy to provide additional quotes. We can also create fully custom wedding invitation design and printing. The designs in this suite were created for Dependable Letterpress by Annemarie Munn of Lady Bones Print Co.